Whether you are travelling to South Korea on holiday or for an important business meeting it is important to know how to say hello in Korean. Many people are put off travelling to South Korea but the acts and behaviour of their neighbours North Korea, fear not South Korea is a wonderfully versatile place that makes for a great vacation! The people are super friendly and the city of Seoul is one of the most vibrant on the planet. South Korea offers some amazing food too! Very heavy on the meat content the Koreans love a barbecue! Whenever you travel to a new country it is always polite to try and learn some of the language. Nobody even laughs at someone for trying a new language and making a mistake for we all know how hard it is and how challenging it is to get your tongue around new vowels and consonants! Korean is one of the tricker languages to learn, not only does it not follow the latin alphabet but the language is also tonal making your pronunciation even more important! Many people confuse South Korea and the Korean language with Japanese and Chinese. Don't be fooled, to say hello in Chinese, Mandarin or Cantonese you say ‘nin how’ where as you’re about to learn that this is not the case in Korean! 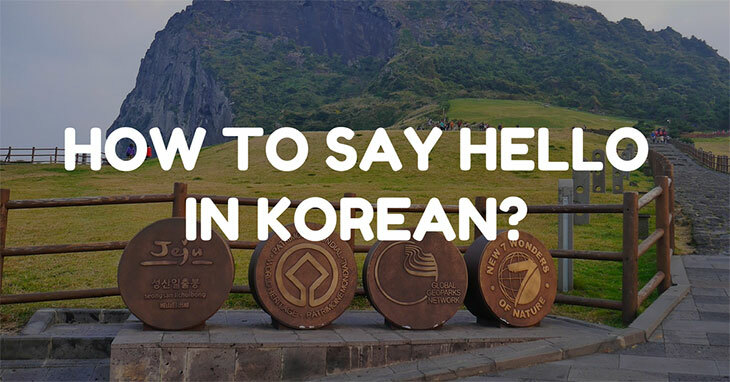 This guide will take you through how to say hello in Korean in the most basic way, how to say hello in Korean in informal situations and how to say good morning in Korean too! Like we mentioned above, the first word you should learn in any language is hello and Korean is no exception! Saying hello in Korean is easy in theory but you must work hard to ensure that you do not cause offence unlike saying hello in different languages saying hello in Korean requires you to address the person you are talking to in a respectful and courteous manner. To say hello in the most basic way in Korean you say ‘anyoung haseyo’. You pronounce ‘anyoung haseyo' like ‘ahn-yong hah-say-yoh.’. It is a bit of a mouthful but once you’ve solidified this phrase in your brain it will roll off your tongue easily! If you are saying hello to someone clearly older than you or you wish to convey the utmost respect to them you should use the phrase ‘anyoung hashimnikka’. ‘Anyoung hashimnikka’ is pronounced ‘ahn-yong hahshim-nee-kah’. You may not find yourself in many formal situations where you have to use phrases like ‘anyoung hashimnikka’ very often. Instead there are some formal greeting you can use. To say hello informally in Japanese you say ‘Kon’nichiwa’. Although there are some parallels you can draw between South Korea and Japan there are very few on the language front. To say an informal or casual hello in Korean, between friends, colleagues or people familiar to you you can use simply ‘anyoung’. This does not translate to hello, however. The phrase ‘anyoung' translates to 'be peaceful’ in that sense it is very similar to the Hebrew greeting of ‘shalom’. A more casual greeting is also used when answering the phone. South Korea is tech-mad and you’ll be hard pressed to find someone who is not addicted to their phone! When answering the phone in Korean you say ‘yeoboseyo’. ‘Yeoboseyo’ is pronounced as ‘yo-bo-say-yoh.’ It matters little who is on the other end of the phone, no need to be formal, answer with ‘yeoboseyo’ and you’ll sound like a local! If you want to expand your new found language skills further you should learn how to say good morning. It adds another phrase to your repertoire and makes you seem more confident to the person you are greeting. To say good morning in Korean you should say ‘jo-un a-chim’. ‘Jo-un a-chim’ is pronounced as ‘jong-un ah-chim’ and is a simply and easy to remember phrase that we are sure you will enjoy trying out! So now you know a little of the Korean language it is time to test yourself! Next time you head to your local Korean restaurant for lunch or dinner be sure to greet your host with a hearty ‘anyoung haseyo!’. Panic not, if you forget all of this then a nice smile and a simple ‘hello’ will too, see you right.